South Korea's top diplomat said Monday her government will redouble diplomatic efforts to pull off denuclearization and lasting peace via the "virtuous cycle" of improved inter-Korean relations and progress in the denuclearization process. 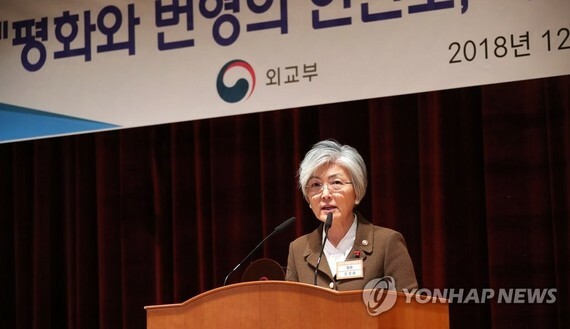 Speaking at the opening of the annual gathering of the country's envoys abroad, Foreign Minister Kang Kyung-wha said, "Now, we are facing an important opportunity for a resolution to the North Korean nuclear issue." "The journey, going forward, won't ever be smooth, but I believe in the power of our diplomacy," she stressed. The world is paying attention to South Korea's initiative for dialogue with North Korea to achieve the peace and prosperity on the peninsula, she added. Kang reaffirmed Seoul's strategy to improve its ties with Pyongyang in a bid to help denuclearization talks bear fruit despite concerns about a possible rift with the United States over the issue. U.S. officials are apparently concerned that speedy inter-Korean cooperation may have a negative effect on sanctions on Pyongyang and hamper denuclearization talks. The five-day annual session has brought together a total of 181 ambassadors, consul generals and other heads of diplomatic missions in foreign nations. Major programs include special lectures by Yoon Young-chan, senior presidential secretary for public communication, and Yoon Jong-won, senior presidential secretary for economic affairs. Park Eun-jeong, chairwoman of the Anti-Corruption and Civil Rights Commission, is also scheduled to lecture on the government's anti-graft policy. National Security Advisor Chung Eui-yong plans to brief the envoys on the foreign and security policy direction of the Moon Jae-in administration.